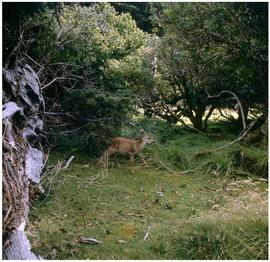 Image of a fawn in a grassy area (on Anthony Island?). 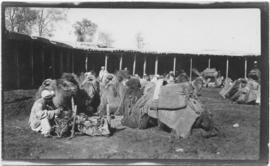 Item is a print of camels loaded with bundles, people and a wall in the background. 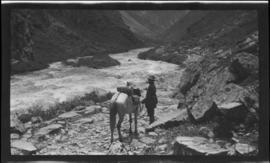 Item is a negative showing a man, Lt. Parker standing in front of his horse next to a river. 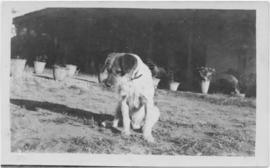 Parker is faced away from the camera and is looking across the river. There are mountains in the background. 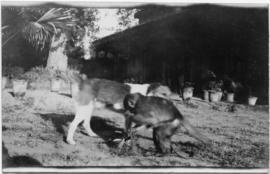 Item is a photograph showing a dog panting. 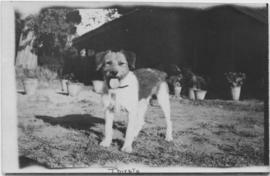 Item is a photograph showing a dog. 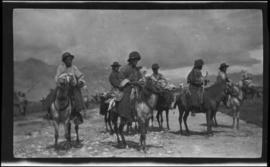 Item is a negative showing a group of men on horseback. 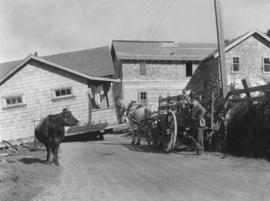 The men are wearing wide brim hats and some appear to be carrying slings of arrows. 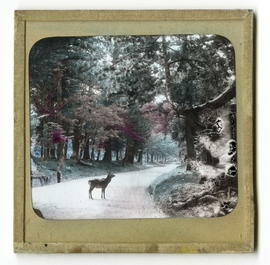 Image depicts a deer running through a clearing. 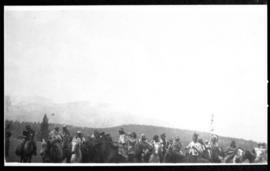 In the distance are several unidentified, human-made constructions, trees, a river, and mountains. 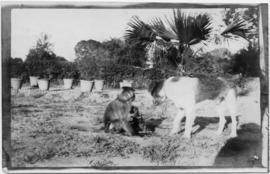 Item is a photograph showing a dog grooming a monkey. 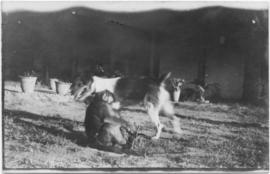 Item is a photograph showing a dog playing with a monkey. 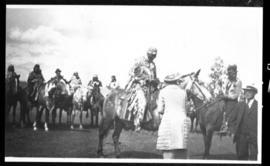 Numerous people, most in native dress, ride on horseback. Mountains and trees visible in distance. This is a group portrait of many individuals standing outside. 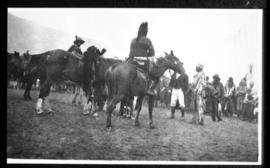 Some wear native dress; some appear on horseback; still others stand next to horses. 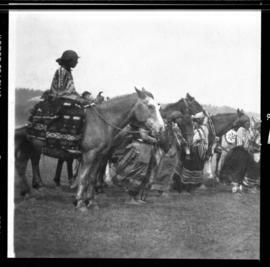 Several men wearing native clothing sit astride horses, facing away from the camera. Other men stand in a field near them. A tipi can be seen copy right and mountains are visible in the distance. 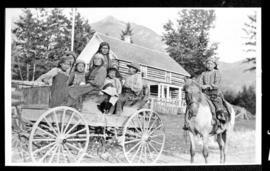 Eight individuals, women and children, sit atop an open wagon. 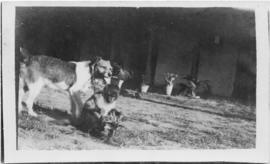 On the right a boy sits astride a horse. 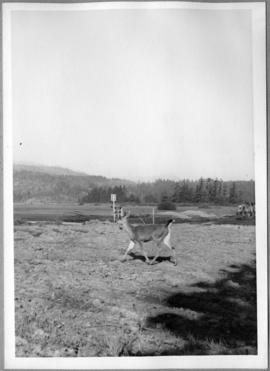 A two-storey frame structure can be seen in the background, with trees and mountains in the distance. 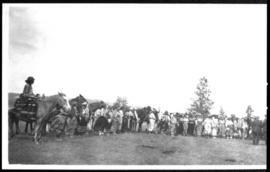 This group shot depicts a man on horseback, women standing, and several other horses. 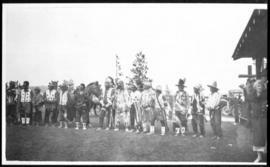 Most appear to be wearing native dress.